Well hello there, and thanks for asking! We know that you have been hard at work trying to research which is an afforable Honda parts or service center in the Los Angeles area, and that’s why we have put together this list of questions and answers to make it easier for you. We’re happy that you came across Airport Marina Honda, and will do our best to answer your top questions to aid in your research. If you don’t feel like reading through this, remember you can always call one of our friendly staff at 888-381-0444. Q) How much will I be able to save if I visit Airport Marina Honda? A) Quite a bit. We know that the main reason why anyone visits any business is for the cost effectiveness, and we can definitely help you in that area. Just browse through our new service and parts specials and you will be able to see how much we can save you on your next oil change, new tires, or brake replacement. 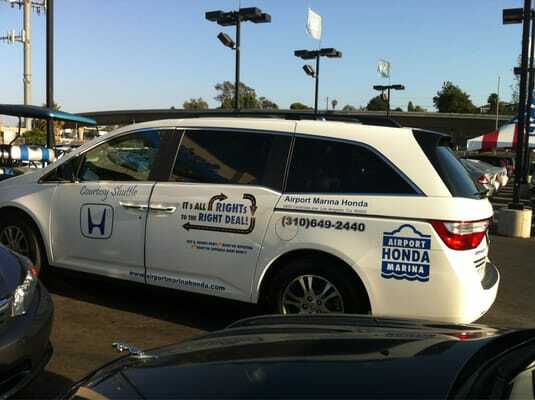 Whether you need major service for your Honda or simply need new tires for your CR-V, we got you covered. Q) Saving money is good, but I also want convenience. I want quick, efficient, and productive. Can you give me that? A) Of course! We know that spending your time at a dealership on a Saturday is not your idea of fun weekend plans. At our waiting room, you can enjoy complimentary Wi-Fi, shuttle service, cookies and cupcakes, coffee and hot chocolate, magazines, and cable TV. Want quick and efficient? No problem. Simply use our Honda express service, which takes approximately 60 minutes or less. With that you will receive an oil change, tire rotation, brake inspections, battery test and more! Visit our specials page to print any coupons you need before visiting us on your next service appointment! Q) My Honda is my baby. I need to be able to trust whoever handles her. Can I trust you? A) Yes. Our technicians have decades of experience and know how to properly handle your baby. We use genuine Honda parts to ensure the superior performance and reliability you are accustomed to. Our parts technicians are friendly and knowledgeable, they will be able to help you find the part you need or answer any questions you have. 0 comment(s) so far on Why visit Airport Marina Honda for Service and Parts?